There’s an invention in human history that’s older than you think. It’s older than coins, paper and the alphabet. In fact, it dates back to 3500 BC, before Stonehenge or the Pyramids. That ancient invention? The shoelace. Think how many technologies have fallen away in the 5,000-plus years since shoelaces came on the scene. From VHS tapes to the horse-drawn carriage, they’ve come and gone — and yet the shoelace remains. It remains, somehow, despite its imperfections. We’ve all had laces come undone on us, forcing a sudden time-out. And because the foot visibly swells throughout the day – even over the course of a single basketball game — we have to constantly tie and untie our shoes to get the fit just right. Shoelaces: you had a good run. But we think we may have finally bettered you. Inside the revolutionary Nike Adapt BB sits an intricate lace engine. When we took on the challenge of finding the next lacing system for performance footwear, we knew the answer would be found in a personalized solution. That’s because fit is a personal thing. Our mission is to solve problems for athletes, and delivering to their exact needs has always been the best path forward. Earlier today, we debuted the Nike Adapt BB, a revolutionary basketball shoe with an intricate lace engine neatly closes around your entire foot. It remembers, via a paired app, how tight or loose you prefer your footwear — not just one setting, but in different situations like warm-ups, gameplay and while resting on the bench. This, finally, is the precise performance fit our athletes have long demanded — exactly when they need it, with the push of a button or a tap on a phone. And with your own personal fit, Nike has finally made countless dreams come true: a custom shoe for everyone. As you could guess, I’m incredibly proud of the team that worked on Nike Adapt BB. Like the athletes we serve, I’ll admit we are some pretty demanding perfectionists, and we have poured years into this project. It reminds me of one of the first projects of my Nike career: the Air Huarache, a shoe that fit, felt and definitely looked different. That instinct to challenge convention has never left me. My starting point is always curiosity. I love probing and questioning what’s out there, trying to get a feel of what’s possible. I was a geography major in college, and the study of the intersection of human activity and the physical world around us has shaped my work more than I ever could’ve expected. After all, what we’re launching this week goes far beyond a shoe. Our long-term vision for innovation at Nike is a world in which intelligent products adapt at the speed of sport to improve an athlete’s performance. 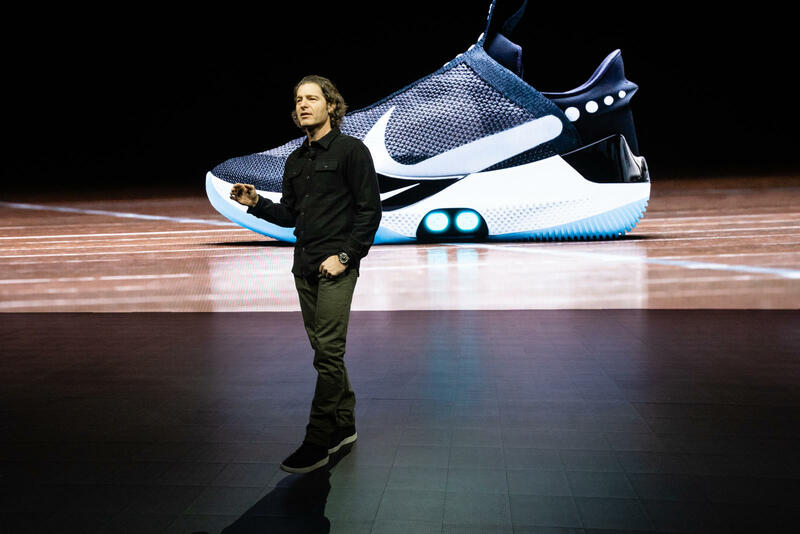 Shoes in our Nike Adapt platform — of which Nike Adapt BB is the first — can update and evolve after purchase, letting consumers opt in to provide you with new services and features through smartphone-like technology. In other words, we’ve finally added firmware to footwear, letting us continuously improve the product you’ve already bought, responding as need be to changing preferences and environments. What’s more, you don’t just connect with footwear through Nike Adapt. You connect with Nike. What do I mean? Imagine a cycle, where opting in creates data about your activity to inform personalized guidance from Nike. And as your performance improves, we can connect you to new product and services for your new goals — and the cycle continues. For most footwear out there, buying the shoe is the end of a transaction. But here, buying the shoe is just the beginning. These conversations have the power to unlock benefits we’ve never seen before, bringing the latest sport science to all athletes everywhere, including real-time personalized training and guidance. It will also help us make products better, with feedback given in a first-of-its-kind true dialogue. It’s a unique conversation between you, Nike and your shoes — one in which you decide what data you share with us, and when. We started this journey in basketball because NBA athletes are some of the most demanding of their footwear. But we’ll be expanding FitAdapt later this year across more performance and lifestyle categories and in even greater quantities. Something tells me, in 5,000 years, shoes without a perfect fit may also be going the way of the horse-drawn carriage.